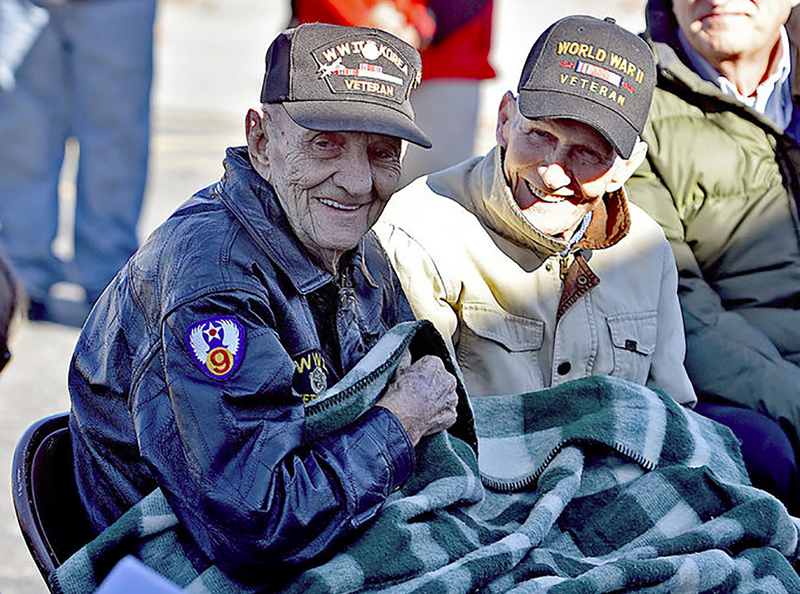 Veterans Herbert Lindsay (WWII, Korea), left, and Harold Stone (WWII) smile toward the crowd as they’re acknowledged during the 5th Annual Healing Fields Ceremony Sunday at the Raleigh County Veterans Museum. BECKLEY, W.Va. — One hundred years to the day after fighting ceased in The War to End All Wars, World War I, community members gathered at the Raleigh County Veterans Museum on Harper Road to honor and remember those who have served in the armed services of the United States. Originally Armistice Day, Nov. 11 officially became Veterans Day in 1954 after the two American wars that followed World War I. As memorial flags waved in the brisk but sunny afternoon sky, museum director Cindy Parker thanked those in attendance for coming to the ceremony.